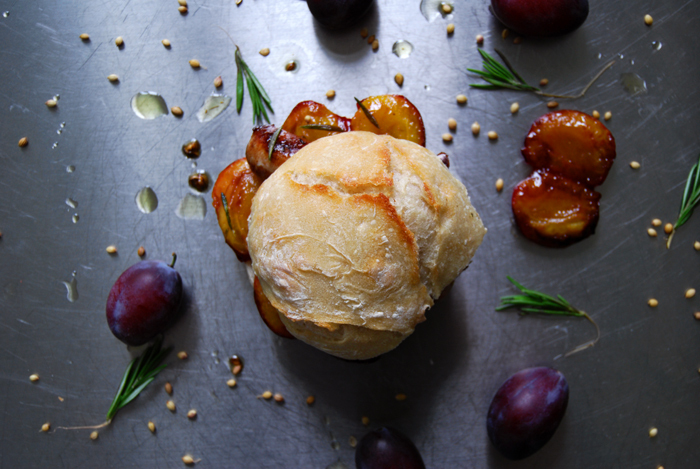 This sandwich has been on my mind for weeks and it might have something to do with the fact that my kitchen has become a store room for Damson plums. I buy these fruits in big baskets, lots of them, and it doesn’t seem like it’s going to end soon. As long as they are in season, I’m a loyal and dedicated fan! 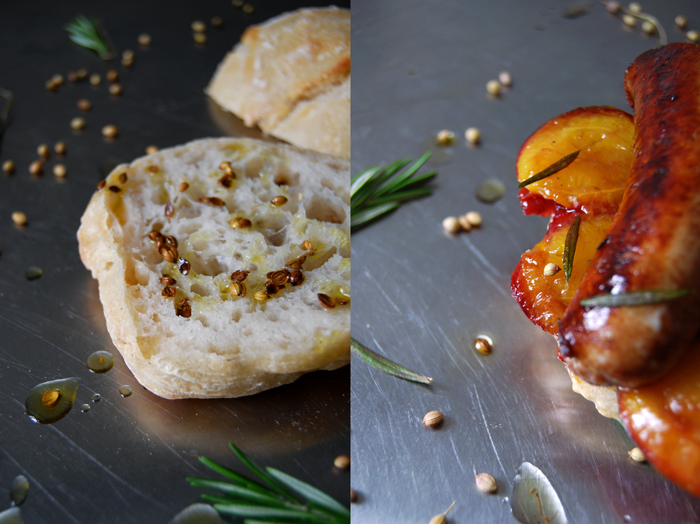 They give me endless inspiration for sweet and savory dishes and for new culinary experiments. I’m hooked on their strong taste, this subtle sweet and sour combination goes so well with all kinds of spices and flavours. The common round black plums are another kind that taste much sweeter but they’re lacking in depth, so I strongly recommend Damsons for my sandwich! And here it comes, a new sausage sandwich! 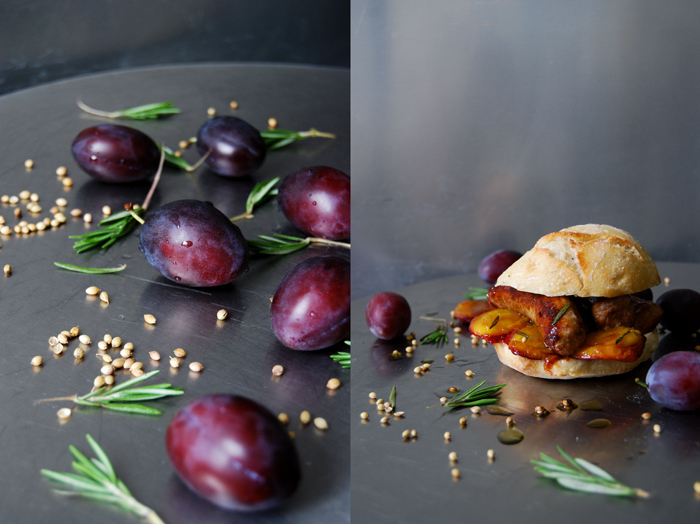 The last time I made one was in Malta, my sausage sandwich with rucola and coriander oil. Today, I feature this spice oil again, coriander seed infused olive oil, as it goes so well with this kind of meat. The seeds are actually one of the main ingredients of Maltese sausage which is one of the best in the world to me (and that means a lot from a German!). I sprinkle the oil and the crunchy seeds on the buns and let them soak into the soft and juicy sponginess, that’s my favourite way to start a sandwich! I fried a couple thick, coarse sausages with fresh rosemary needles. The herb is great for the topping when it turns woody and crisp, but the needles also add their aroma to the frying juices which I pour on the buns before I put the meat on. And now, my fruit of the season comes in, I caramelized the plums for just a few minutes in sugary butter, I wanted them soft but not soggy. 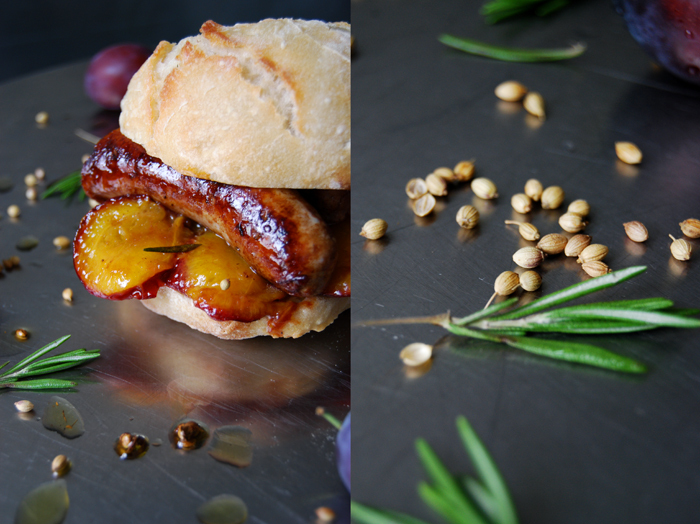 Their sour sweetness combined with the dark flavour of caramel is all a sausage sandwich could ask for! We loved it! In a sauce pan, heat 3 tablespoons of olive oil and the coriander seeds and let them infuse the oil on medium heat for 2 minutes. In a heavy pan, heat a splash of olive oil and cook the sausages until golden brown on all sides. Add the rosemary needles for the last 2 minutes or until they are crisp, but not dark. Cut the sausages in half and set aside, keep the frying juices. Melt the butter and sugar in a pan on a high temperature. When the sugar starts to turn brown, add the plums, cut side first. Cook for 2 minutes, gently turn the fruits and cook on the other side for 1 minute. Take the pan off the heat. 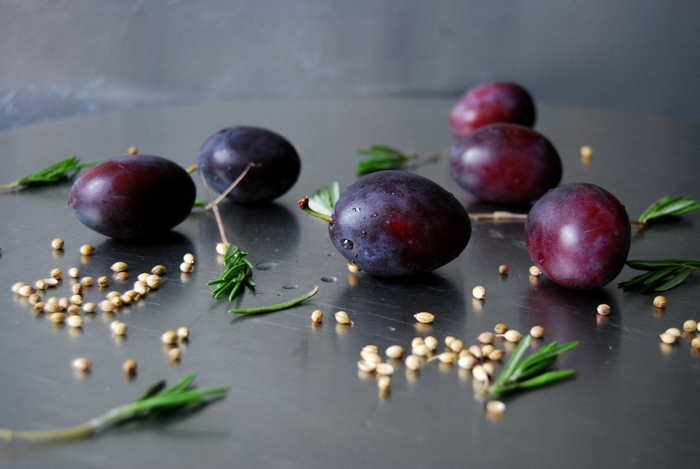 Brush the buns with the coriander oil, add some of the seeds and lay the plums on top. 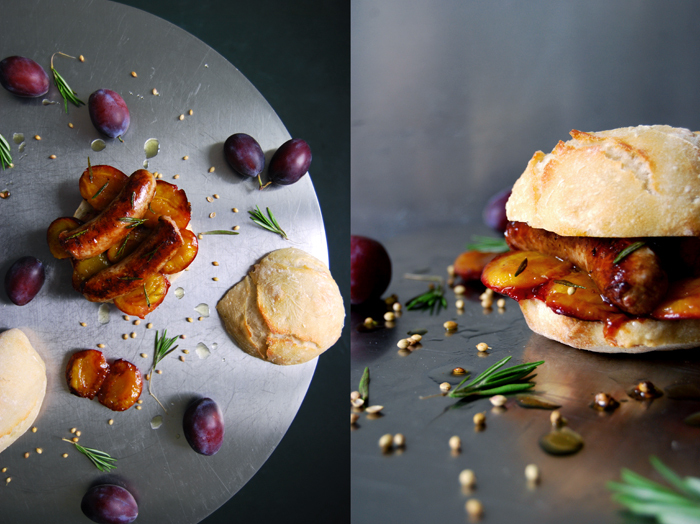 Brush the sausages with a little of the caramelized juices of the plums and put them on top of the fruits. 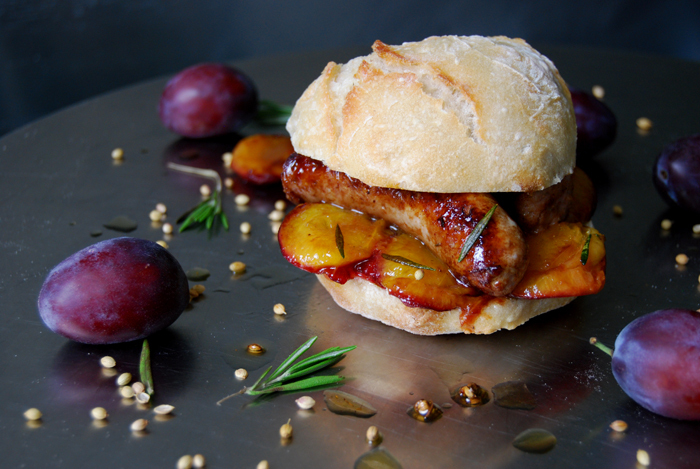 Pour all the remaining juices of the sausages and plums over the sandwiches and sprinkle with a few of the crisp rosemary needles. Close, squeeze and enjoy! The flavours in this sandwich sound amazing! 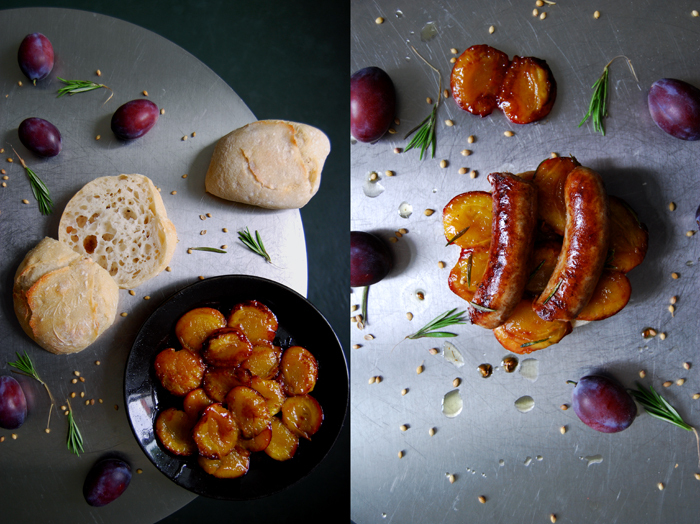 Thanks Kathryn, plums and sausages are a great combination! I could have eaten two of those sandwiches!